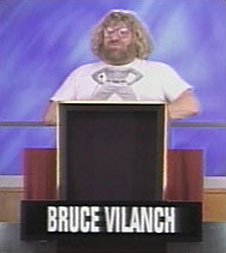 Bruce Vilanch is an enormous, bearded, gay Jewish gagwriter for the Oscars telecast, and a fountainhead of one-liners for many of Hollywood's stars. He has a Mason Reese-esque haircut and has rarely been seen in public wearing anything more formal than blue jeans and one of his many smartass T-shirts. Vilanch's career as a celebrity bon vivant began when he was writing features for The Chicago Tribune, and schmoozing with whatever celebrities or semi-celebrities were in town. That's how he met then-struggling nightclub singer Bette Midler, and the two became fast friends. It was Vilanch who gave Midler some helpful career advice: "You’re pretty funny. You should talk more onstage". He wrote for Midler's 1974 Broadway show, Clams on the Half Shell, then moved to Los Angeles to write for The Brady Bunch Variety Hour. When that show ended, Vilanch wrote jokes for anyone who'd hire him, including Lily Tomlin, Billy Crystal, Roseanne Barr, Rosie O'Donnell, Paul Reiser, Elizabeth Taylor, and Robin Williams (though Vilanch says it's more accurate to say he's written comedy "at" Williams than "for" him). He co-wrote Midler's Divine Madness act of 1980. Remember the next-to-last night of Johnny Carson's Tonight Show, when he was serenaded and sweet-talked by Midler in a sentimental moment that had all America misty-eyed? Midler sang the song and delivered the lines, but Vilanch wrote the words. He also wrote Ted Danson's controversial blackface routine at the Friars roast. He was head writer and a panelist on Hollywood Squares for four years, writing gags for the other panelists while his pal and client Whoopi Goldberg ran the show. Vilanch has also toured as Edna Turnblad in stage productions of Hairspray, the role earlier played by Divine and Harvey Fierstein. A 1999 documentary, Get Bruce, chronicled Vilanch's day-to-day life, and showed that while he's pretty damn funny, his wisecracking mother is funnier. Cowrote the 1978 TV masterpiece The Star Wars Holiday Special. Joey Guerra, "Bruce Vilanch's Gay Reality", After Ellen, 21 March 2006.